When you are choosing fabric to sew clothing for children you want the fabric to be washable and durable. Preshrink any fabric before you begin your project. The Weave -- Take a close look at the weave of the fabric. If you can see light between the fibers the fabric is loosely woven and odds are it will not hold up to the riggers a child will put clothing through. When the fibers are tightly woven they cannot shift as easily as loosely woven fibers and dirt can not work its way in between the fibers as easily which can lead to the fibers being destroyed. Wrinkles -- Consider the wrinkle factors. If you wad a handful of the fabric and squeeze it in your hand, does it create wrinkles that don't relax when you smooth out the fabric? If it keeps sharp wrinkles, it's going to stay wrinkled in the finished garment as your child wears the garment. Avoid Fading -- Clothing for children is going to need to be laundered and after many washings, you don't want all of the colors in the fabric to be washed out. Look at the print on the fabric, does the dye go through the fibers or is it rolled on and barely saturating the fibers. If the dye is not embedded in the fabric it will probably fade out after a couple of washings. Choosing from the fabric shown in the photo, A and C are the best choices. Sample A is a green print on a dyed green fabric and sample b is a solid color fabric which is the same color on the front and back because the fibers are dyed. The B samples are prints on a white base fabric. The print is rolled on to a plain white muslin so the dye is not totally embedded in the fibers and is more apt to fade after repeated washings. Combining Fabrics -- To add details to children's clothing, it is common to combine two or more fabrics within the same garment. Be sure that both fabrics require the same laundering techniques and that the fabrics are colorfast before combining them. Colorfast information should be on the end of the fabric bolt but if it is not, you can test it by placing a small scrap of the fabric in a dish of water... preferably in a white bowl so you can really see if any of the color leeches into the water. Always preshrink fabric before sewing a garment. Comfort -- Canvas is a very durable fabric but it sure wouldn't be comfortable. Choose fabrics which will move as the person wearing the garment moves. Choose a fabric that is not rough or irritating on the skin. This can easily be tested by rubbing the fabric on the inside of your wrist. Grow Ability -- In most cases, children outgrow their clothing before the clothing wears out. If you want clothes that offer a bit more time in a child's wardrobe, remember knits and elastic. The less "fitted" a garment is, the longer it is apt to fit and be worn. Children's Sleepwear -- Sleepwear for children must meet Children's Sleepwear Regulations. The end of a fabric bolt will state "NOT INTENDED FOR SLEEPWEAR IN THE USA" if the sleepwear fabric does not meet these guidelines. Elastic is a relatively inexpensive sewing notion. Sure you can find hanks of elastic at the dollar stores but consider how much you will be relying on the elastic. Children understand being comfortable much more than they understand a bargain. Spend a few extra cents and buy sturdy non-roll elastic. Other elastics will curl in a waistband and end up being uncomfortable or not doing the job. In most cases, once elastic is sewn it is inside a casing and no longer accessible unless you open the casing. If the elastic unravels at all or is not securely sewn together, someone is going to have a problem such as keeping their pants up. When you are sewing elastic to secure two ends together, be sure to sew a secure overlap. 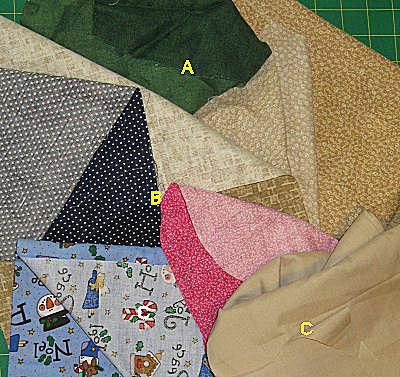 A square with an X in the middle is one of the most secure ways to sew the ends together. Buttonhole elastic extends the life of many garments. Shorts are a great place to use buttonhole elastic because unlike pants and slacks, shorts can be short. Buttonholes in the inside of the waist casing allow access to adjust the length of the elastic being used. Seams are the mainstay of almost every garment. Active children are going to put the durability of how a garment is made every time they wear the garment. Seam Finishes -- All seams should have some form of a seam finish. Seam finishes not only hold the fibers secure when the garment is washed, but they also add strength to the seam. Flat Felled Seams -- Flat felled seams are a bit more work than a plain seam but they are extremely strong. If there are straight seams with very little curves, sew flat felled seams to add strength to the garment. Reinforcing Seams -- Curved seams such as sleeves and crotches are usually trimmed to help the garment lay properly. This can weaken the seam but it does not need to. Reinforce these curved seams before they are trimmed by sewing just inside the original seam line. You can use the same needle position to sew just inside the original seam line on the seam allowance. After reinforcing the seam, trim the seam allowance and apply a seam finish to further strengthen the seam. Curved Seams -- Simple elastic waist pants and shorts are very easy to sew a strong, durable crotch seam. Turn one leg right side out and one leg wrong side out. Insert the right side out leg inside the wrong side out leg and align the notches and edges. Sew the crotch seam as one continuous seam and reinforce it as described above before trimming and applying a seam finish. All toys for children have rigid guidelines to keep children safe from choking hazards. Clothing does have some safety guidelines. It is up to you as the creator of a garment to be aware of what you are sewing and how you are sewing it. As you sew a garment for a child it is essential to keep safety in mind. All buttons and snaps must be sewn on securely with strong, quality thread. Trims with beads or sequins should be avoided on clothing for children who are putting everything in their mouth. Snaps are a commonly used closure on infant and toddler clothing. Snaps come in a wide variety of sizes and are made from different materials. Lightweight nylon snaps add next to no weight to the garment and are almost undetectable against the skin. When you are sewing for very small children, consider using snap tape. The snaps have been secured at a factory and you sew the fabric tape to the garment, ensuring a safe closure for baby clothing. If you are going to sew your own pronged snaps, be sure the prongs are long enough for the layers of fabric and that they are totally secure before the child wears the garment. Think outside the box to help a child learn to dress them self. As a child becomes old enough to dress themselves, you can help them by sewing closures that are easy for them to handle. A tiny button will be difficult for small fingers but by simply sewing on a slightly larger button, it becomes something a child can manage. Attach a ribbon to a regular zipper pull to make the zipper easier for small fingers to maneuver or add an extra zipper pull to a zipper. Explore the many types of zippers to have the perfect zipper for your project. If you need a hook and eye closure, consider a trouser hook and eye verse a tiny hook and eye that is to small for a child to handle. You may also want to consider a hook and loop closure which is very simple for a child. Sew a button on the outside as a decorative touch which can mask the hook and loop closures.